When I got my nails done last week, it was a bright sunny day and I was feeling really optimistic. Last time, I'd been set on Essie Mod Square and decided against it, so this seemed like the perfect time to try it out. Unfortunately, when I got to the salon, I couldn't find this particular bottle anywhere so had to settle on a different pink shade. The one I chose is this pink-red colour from Daisy. Frustratingly, none of the Daisy polishes have names on the bottle so I have absolutely no idea which one it is. Most of the options in my salon are by Daisy but I try to stay away from them as I like knowing exactly which colour I've gone for. 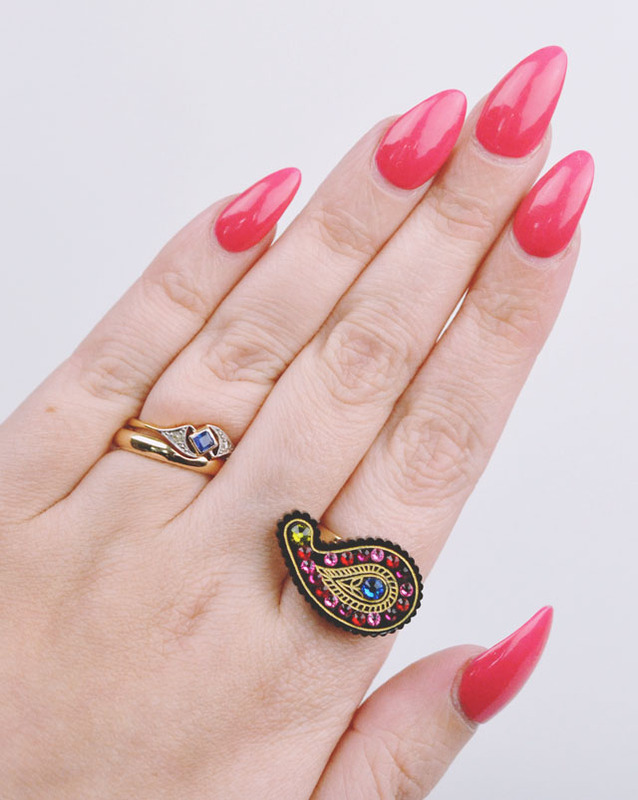 My cute paisley ring is from Tatty Devine. They're just announced their Lucky Dip boxes which are pretty much the most exciting thing ever. Priced between £22.50 and £50, you will receive 3- 4 mystery pieces of jewellery. Although you won't know what's inside the box, it's guaranteed to be cute! 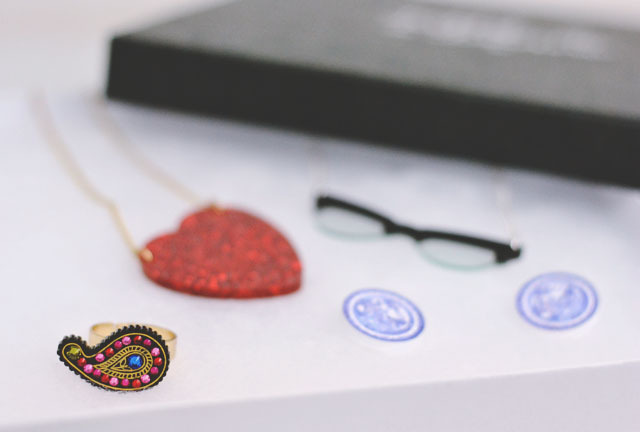 As well as this ring and a pair of Blue Willow earrings, I also found two necklaces- glasses and glitter heart. Not bad for £40! Thanks to Tatty Devine for sending me a Lucky Dip box. This is a gorgeous colour even without the name! Thank you for following me on bloglovin, I have followed you back and can't wait for more posts from you :) your blog is so pretty!